The M.U.S.C.L.E. 4 Packs allowed you to see exactly which figures you were getting. They were cheap to buy and were available firstly as all-flesh packs, then 2 flesh and 2 colour figures and finally all-coloured figures. The reverse of the pack had the mail-away poster offer, although earlier all-flesh 4 Packs do not have this offer because the poster was not released at that point. Some of the all-colour figure packs do not have the offer either as the poster was discontinued towards the end of production. The M.U.S.C.L.E. 10 Packs are probably the packs most people remember from the 80’s. A trash can style container which was opaque so you couldn’t really make out which figures were inside. Like the 4 Packs, they were first released as all-flesh figures then half and half and later only as all-colour figures. Sealed 10 packs are quite common and are one way of acquiring absolute mint condition M.U.S.C.L.E.’s, although most collectors prefer to keep them sealed. There were four different M.U.S.C.L.E. 28 Packs and the figures in these sets were not available in the 4 and 10 Packs. Again, they were released in the same pattern of all-flesh, then half flesh/half colour and finally all-colour figures. The only differences on the front packaging was the title and the colour of the star burst behind the MuslceMan illustration and the colour of the box’s sides were different for each pack. Although some of the 28 packs do not have the Ninniku symbol on the MuscleMan’s forehead and some do not have the poster offer. This was the only playset available in the M.U.S.C.L.E. line and was probably the best accessory available. Each player put a figure in the clamp and then you franticly moved the joystick in a bid to knock your opponents figure down. Some figures fit the holding clamps better than others. Mattel did not produce the Wrestling Ring themselves, it originally came from the Kinnikuman range and was made up of their two different style wrestling rings. It came with two figures exclusive to the Wrestling Ring (MuscleMan and Terri-Bull) which didn’t appear on the collector’s poster. The MuscleMan is a slightly smaller version of #141 and has a different belt buckle, while the Terri-Bull is a completely unique figure. However this Terri-Bull figure was included in an exclusive green with the Mega-Match Board Game. A wrestling style belt with a compartment for keeping M.U.S.C.L.E.s won off your friends during a Wrestling Wring battle. The buckle doubled as mini wrestling ring which was so small you couldn’t play in it and the compartments only held 10 M.U.S.C.L.E.’s. Aside from that you looked a complete idiot wearing it! This wasn’t the best accessory by Mattel by far, but was the only one they actually produced themselves. There were 2 different versions of the packaging it came in, a box with a die-cut window and windowless box. Mattel most likely stopped manufacturing the window box due to cost so the window box is more prized by collectors and therefore commands a higher price. The M.U.S.C.L.E. Mega-Match Game was a board game that you could play with your M.U.S.C.L.E. figures. 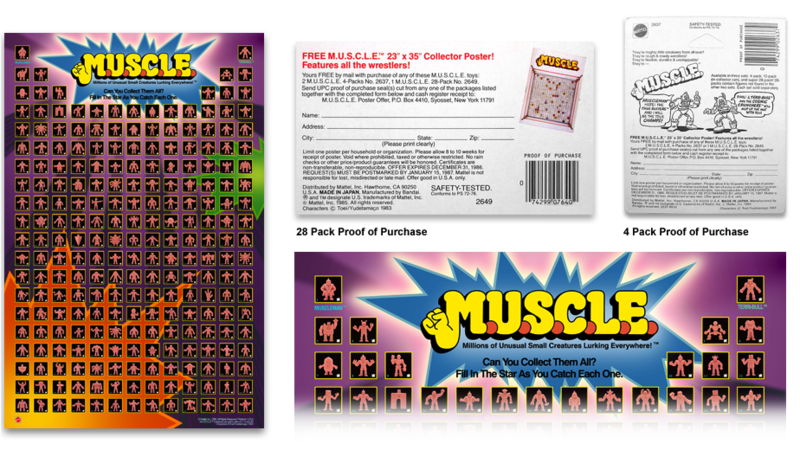 The game came with 10 M.U.S.C.L.E.s which consisted of five good guys and five bad guys, with MuscleMan and Terri-Bull as the leaders of their team. The bad guys (led by Terri-Bull) were in the standard M.U.S.C.L.E. green, while the good guys were grape in colour and were exclusive to the game, so there were only 5 grape coloured M.U.S.C.L.E. sculpts ever produced. The green Terri-Bull figure featured on the front of the game box was not the same sculpt that came inside the box. The Terri-Bull figure actually included with the game was exactly the same as the Wrestling Ring sculpt, but in green, making it exclusive to the game. The other green figures were not unique to the game as they have since been discovered in sealed 4-packs. The M.U.S.C.L.E. Poster was a mail-away offer from Mattel. Only one poster could be ordered and you had to send proof of purchase of either two 4-Packs or one 28-Pack. The first poster Mattel released was all flesh figures then as the line expanded into more colours the poster was updated with a mix of all the new colours (with the elusive purple #153). The posters measured 23 x 35 inches and featured 233 figures with each figure having a small star in the corner to tick-off as your collection grew. In 1986 a Nintenedo game for M.U.S.C.L.E. was released. It was called ‘Tag Team Match M.U.S.C.L.E.’, known in Japan as ‘Kinnikuman Muscle Tag Match’, and was based on characters from the Yudetamago’s manga and anime series Kinnikuman. It has eight playable characters, each with his own special move. The game was not produced by Mattel, it was released by Bandai who produced the original Kinnikiuman figures. The gameplay was Singles mode (one on one bout) Two-on-Two tag team wrestling match. 1 Player or 2 Player Versus. The A button jumps, and B punches or activates a special move after collecting an energy ball that is randomly thrown by the boy called Meat. Moves that can be done, punch, jump, drop kick, shove, shove into ropes, flying body attack (jump into ropes and rebound), lariat a.k.a clothes line, shove enemy into ropes, back drop a.k.a suplex. Brocken Jr. (Japanese version only) note that Brocken Jr. and Geronimo are the same in this game, just slightly different graphics. Noted as one of the 20 worst games for the NES. The graphics were awful even for 1980’s technology and the controls not very responsive, but still many M.U.S.C.L.E. collectors want the game as part of their collection because of the M.U.S.C.L.E. branding. MuscleFigures.com does not offer the games for purchase.